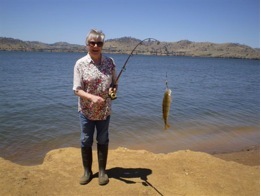 Vivienne at local Lake Hume with a freshly caught little redfin – just to prove I do have a real interest in fishing. But you have to go up the mountains to Dartmouth for the best trout described below. First, catch your trout ! My daughter and her bloke went on a camping/fishing long weekend. As recent owners of a rejuvenated boat with new engine and trailer it was time to give it a good work out at the famous Dartmouth Dam. They had been told about a good camping/fishing spot which could only be accessed by boat. This was great but a bit daring as there is no mobile reception there and the weather had turned a bit dodgy. First day was a bit miserable but they had a good fire going having abandoned the rough waters after a lot of getting wet and getting no fish. Day two dawned and it was perfect. Landed one big trout (and some useless carp). Day three was also perfect and landed another big trout. I texted daughter when I knew they must be on their way home. They were in the Eskdale Pub and yes, Mum, have a trout for you. Next day trout was delivered into my grateful hands. Well the trout was big (45cm) and required the removal of head and tail fin before it just fitted my biggest pan. I cooked it slowly in a little butter – very simple. Served with two appropriate salads. The trout took about 40 minutes to cook through (turned once). I presented it on an oval dish which did it justice and then promptly forgot to take a photo (again). The taste was ‘out of this world’ good. Fantastic. Moist. It was the best fish of any kind I had ever had. The water in Dartmouth dam is clear and sweet – part of the recipe for the best trout. Sorry about my stressful posts yesterday , on Friday I could not get to ABC, yesterday Pigs was out of reach…anyhow all’s well today. Your trout must have been tops, with good ingredients you don’t need to much to add…you have made me hungry for fish, we try to eat it at least twice a week. I have a similar problem with launching my E-reader. I have just about given up after two days of trying to load an E- book and transfer it to the Sony E-reader. I authorized the Adobe DRM and just about everything else. This is what I fear and loath about modern gimmicks they are beyond the skills of Joe Blow and have far too may options. I loved the idea of getting books with an e-reader giving to options of reading a larger font. Ah well, might just have to pay an expert. I think it is this website or the WordPress mob which are having problems. Not your computer at all. Don’t take it out on the computer! Great to hear from you again Shoe. I was worried you had permanently buggered off ! Re computer problems – funny how one can learn more as you say but it does come at a cost. sandshoe, you have been missed, good to see you back. I forgot to say that I cooked it in the last of my Myrtleford butter (that butter factory got a gong in the SMH food liftout recently). You paint a vivid picture…LOL.